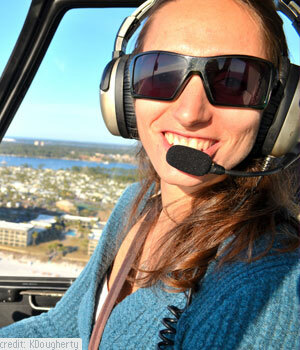 Katie is just one of the pilots of Panhandle Helicopter’s all female staff. A family-owned business since 2008, owner JR. Hott – himself a fixed-wing pilot since 1979 and helicopter pilot since 2006 – makes a practice of hiring female pilots, and claims he has abundant good reasons. “Obviously they are a novelty with tourists,” says JR “but there is also the load issue. There is a total weight limit of 300 lbs. per seat in these small helicopters and the less the pilot weighs, the more likely we’ll be able to accommodate heavier passengers.” The helicopter can carry three passengers plus the pilot, depending on total weight. I settled into the passenger seat next to Katie as she smoothly and effortlessly lifted the machine off the pavement and 300 feet into the atmosphere. 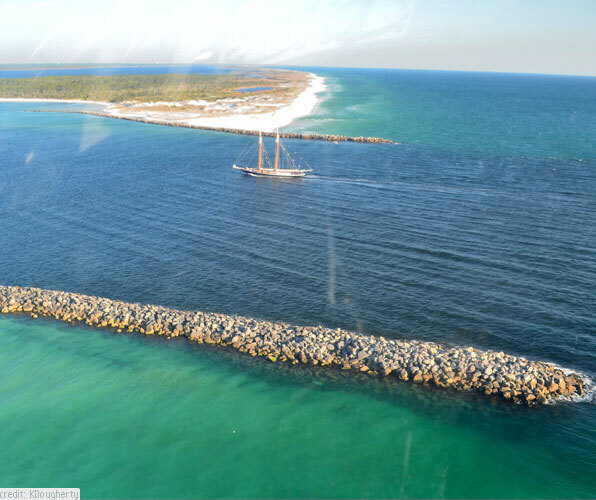 Our 30-minute helicopter ride took us across miles of the Panama City Beach for a stunning panoramic view of the Emerald Coast lined with restaurants, bars, and hotels. We continued down the shore, past historic St. Andrews State Park, the shipping channel, Grand Lagoon, and the photographic Shell Island. I snapped photo after photo of the shimmering green waves lapping onto beach below. “How fast do you think we’re going?” Katie interrupted my reverie through my earphones. I instinctively knew it was a trick question – we were gliding along so smoothly, almost hovering. “50 miles an hour?” I replied. I looked across and saw her big grin and knew I wasn’t even close. “115 mph!” she smugly replied. I craned my neck to get a peek at the dash of controls to verify. That’s how smooth the ride was. 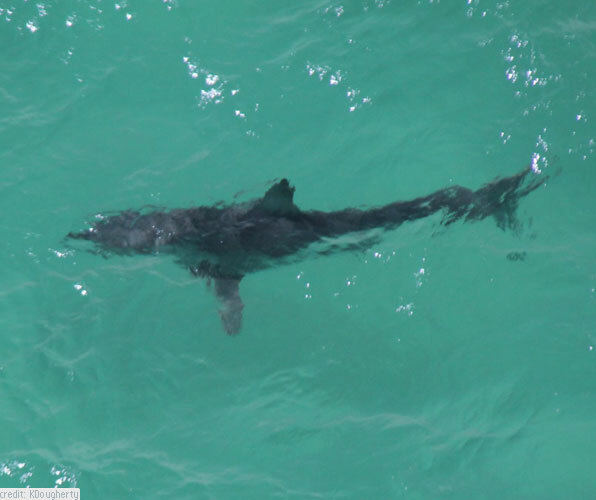 During the warmer summer months, shark enthusiasts can get a bird’s eye view of hammerheads and bull sharks in emerald waters below. Some of the guests on this tour leave with new appreciation of just what they’re sharing the beach with! JR makes the helicopter tours very affordable. Entry prices start as low as $40 per person and go up to $150 – depending on length of time in the air. He’ll also customize a tour to suite a particular need, such as romantic sunset tours or engagement opportunities. Panhandle Helicopter also offers special services such frost protection, aerial patrol, and environmental and land surveys.